Surrender Program - Baker's Bird Shop Ltd. PLEASE CONTACT ANY OF THE BAKER'S BIRD SHOP FAMILY FOR INFORMATION ON OUR SURRENDERING PROGRAM FOR BIRDS. WE UNDERSTAND THAT LIFE HAPPENS, AND YOU MAY NOT ALWAYS BE ABLE TO TAKE CARE OF YOUR BIRD. WE PROVIDE THAT CARE IF YOU ARE NO LONGER ABLE TO. PLEASE UNDERSTAND THAT YOUR BIRD MAY BE RE-HOMED OR PUT INTO A BREEDING PROGRAM AT THE SHOP. 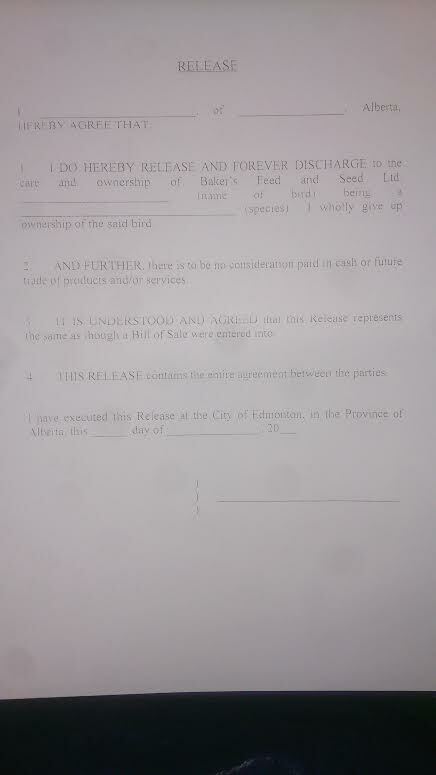 Below is the form you will be signing in order to release your bird into our care. Please read this FULLY and make sure you agree with it before you bring your bird into the shop to be surrendered.